According to Reuters reporter Rick Wilking and Jack Dutton of the Business Insider, fake cell phone towers have been found throughout our fine country. Les Goldsmith, the CEO of ESD America, used ESD’s CryptoPhone 500 to detect 17 bogus cellphone towers. ESD is a leading American defense and law enforcement technology provider based in Las Vegas. “Whose interceptor is it? Who are they, that’s listening to calls around military bases? Is it just the U.S. military, or are they foreign governments doing it? The point is: we don’t really know whose they are,” Goldsmith said to Popular Science. 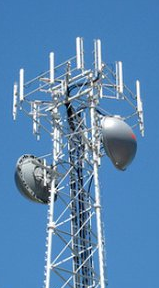 ComputerWorld points out that the fake towers give themselves away by crushing down the performance of your phone from 4G to 2G while the intercept is taking place. So if you see your phone operating on a slow download signal while you’re near a military base … maybe make that call from somewhere else. In an amazing coincidence, police departments in a handful of U.S. cities have been operating “Stingray” or “Hailstorm” towers, which — you guessed it — conduct surveillance on mobile phone activity. They do that by jamming mobile phone signals, forcing phones to drop down from 4G and 3G network bands to the older, more insecure 2G band. Is this what the Matt Sledge alluded to in his 27 March 2014 article when he said “critics warn of ‘much bigger programs‘” or was this too far off the grid to be picked up by him or other main-stream-media journalists? Is this a program to replace the bulk data collection that Obama said he would discontinue or is this another branch of the same program that Judge Richard J. Leon ruled unconstitutional? Considering that this president finds himself at the center of multiple scandals despite the best efforts of the news media (especially the admittedly liberal media members) to cover for him, it might be in our best interests to not ignore these towers. As Christians first and as Americans, we need to inspect the fruit of this administration. By their fruit you will recognize them. Do people pick grapes from thornbushes, or figs from thistles? Likewise, every good tree bears good fruit, but a bad tree bears bad fruit. A good tree cannot bear bad fruit, and a bad tree cannot bear good fruit. Every tree that does not bear good fruit is cut down and thrown into the fire. Thus, by their fruit you will recognize them. Just to be certain that I am understood by those who voted for this administration, let me say it more clearly. We need to observe the actions of others and take applicable safeguards to protect ourselves and anyone who might need our protection.